Fly from your homeport to the city of Adelaide, South Australia. On arrival, you will be met & transferred to your hotel in the heart of the city. The rest of your day is at leisure to explore the city. Travel through the city of Adelaide northwards to the world renowned Barossa wine region. Enjoy the change of scenery as you make your way into the vineyards of South Australia’s premium wine region. Your first stop is TeAro Estate located in a heritage listed 1850s barn in the main street of Williamstown. In the intimate tasting room, you’ll be treated to morning tea and wine tastings, while hearing stories from four generations of family vignerons. On arrival at Lambert Estate at Angaston, you’ll enjoy a structured wine tasting, while sampling local seasonal produce from gourmet platters, followed by the main course. You may wish to purchase a glass of wine from the impressive selection, or enjoy a coffee accompanied by their popular Chocolatier (Chocolate Port). Travel to Mengler Hill Lookout for sweeping views over the valley and then on to your final stop, Pindarie, a multi award-winning cellar door, which feels more like an Australian Homestead. The friendly staff doesn’t just pour the wine, they’ll share the stories behind Pindarie, a great way to finish off your Barossa Food and Wine Experience..
An early morning pick up from your hotel for a scenic coach journey to Cape Jervis taking in the picturesque Fleurieu Peninsula with its vineyards, coastal views and rolling hills. On arrival, board the SeaLink ferry for the 45 minute crossing to Penneshaw on Kangaroo Island. Here you will board your coach and your local Driver Guide will take you on a tour of South Australia’s premier nature-based tourism destination. Your first stop is Emu Ridge Eucalyptus Distillery, for a guided tour and introductory talk about the history of the oil distillery and the chance to purchase some eucalyptus products. Then travel onto Vivonne Bay Bistro located on a 260 hectare bush property, for a delicious two course lunch. Afterwards, visit Seal Bay Conservation Park for a guided beach walk with a National Park Ranger among a breeding colony of wild and rare Australian Sea-lions. You’ll then visit another amazing wildlife attraction, the fascinating Birds of Prey free-flight demonstration, an interactive and educational display of native Australian birds and raptors. From here you’ll travel to Kangaroo Island Wildlife Park, where you can get up-close to koalas, see penguins swim and play, hand-feed kangaroos and learn about endangered species. Visit Clifford’s Honey Farm to enjoy an informative talk by the bee-keeper followed by tastings and an opportunity to sample homemade honey ice-cream and honey beauty products. Then at Hanson Bay Visitor Centre and Café enjoy a two-course lunch. 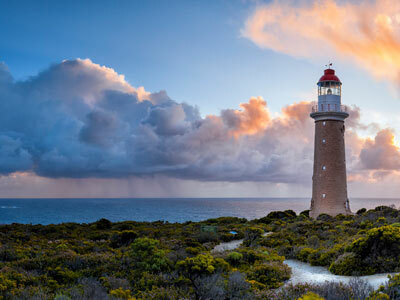 Afterwards, travel to the western-most part of the Island to Flinders Chase National Park, one of Australia’s largest and earliest conservation parks. After a short stop at the Visitor Centre, travel through the park and enjoy breath-taking views of its unique trees, plants and coastal scenery. You will be taken to the rugged southern coastline for a walk around Remarkable Rocks and Admirals Arch. Remarkable Rocks provide great photographic opportunities and stunning sea views. Admirals Arch boardwalk takes you down a rugged cliff face to reveal this spectacular arch, a natural nursery and safe haven for playful New Zealand fur seals that can be seen swimming and playing in the waves or resting on the rocks. Return to Penneshaw Ferry Terminal for the return journey, arriving in Adelaide late in the evening. Your short break concludes this morning after breakfast. You’ll be transferred to Adelaide Airport for your onward flight.